In Charlie Chaplin’s satirical look at World War 2, The Great Dictator, the comic genius lampoons Adolf Hitler in his memorable role as Adenoid Hynkel, leader of the Double Cross. More touching, however, is his character of a Jewish barber fleeing a German concentration camp for the Austrian border and getting mistaken as Hynkel. Refusing the title of emperor, all he wants is peace and an end to unnecessary fighting. His impassioned plea of asking everybody to stop fighting is not only a cinematic masterstroke for its time, but is still relevant today. Chaplin’s final call for everybody to lay down their arms for the true meaning of democracy is moving. Wouldn’t it be great if such a storyline could be replicated so that a country like Burma could be rid of its tyrants and dictators? Imagine the country’s military leaders and armed forces agreeing to lay down their arms for the sake of peace, and begin talking openly with monks, civilians, and political opponents — particularly the recently freed Aung San Suu Kyi — about developing a real framework for democracy; one acceptable to all Burmese, where the constitution would allow for the military to serve Burma in the spirit intended by the nation’s founding father of independence, General Aung San, rather than have the national army fighting several wars at once with its own people. If Senior-General Than Shwe would take the time to watch The Great Dictator, he may just learn something about the consequences of his vanity and obsession with ruling with an iron fist. Burma is a land with resolute, friendly residents who can do little more than watch as their once bountiful lands are stripped bare of its natural resources. Its ‘new’ parliament will be dominated by the pro-military Union Solidarity and Development Party (USDP) after their emphatic victory in farcical circumstances, claiming more than 75 per cent of the votes. The few parties representing ethnic minorities will not be able to forge an effective alliance, although the possibility of the USDP courting an ethnic party for token representation may yet still arise. A quarter of the seats in Burma’s parliament are reserved for the military, where a minimum of 75 per cent parliamentary majority must be secured for any changes to the constitution must be made. Yet there is one voice of hope that gives us all something to savor – the release of Aung San Suu Kyi on November 12. We are all likely to have seen images beamed live around the world showing her supporters flocking to the gates of her residence in Rangoon, ready to hear the address of a woman they had been denied for so long. But at the same time she is aware of the threat posed by the military, with spies watching her every move. One guarantee is that Aung San Suu Kyi does not get fazed easily; she has a job to do and she will complete it. Her message for the crowd was to be brave and work together to achieve positive change, for she could not do it alone. The atmosphere surrounding her arrival, coupled with the massive weight of expectation, was a sight not seen since Nelson Mandela’s inaugural speech in Cape Town in 1990 following his release after 26 years imprisonment jail sentence. Like Nelson Mandela, Aung San Suu Kyi is a wonderful orator, eloquent, brave and inspiring. In declaring her number 75 in their annual Top 100 Global Thinkers List, Foreign Policy noted that following her release, “(Aung San Suu Kyi) made a remarkably levelheaded call for long-term reform of the sort that comes from within: “value change,” as she put it, “not regime change.” This reflects the need for Burma and the rest of the world to take a deep breath, consult, and then get on with the job without resting on laurels. Like her father General Aung San, she is a leader who speaks of political unity and who speaks of Burma’s people like a large family, while recognizing the sensitivities facing ethnic minorities who have suffered immensely as a result of the junta’s war against them. The world’s longest ongoing civil war, between the junta and the Karen National Union (KNU) shows no sign of stopping, human rights abuses against the Shan people continue to occur at an alarming rate, and the Rohingya people in Arakan State are discriminated against as a consequence of not being allowed citizenship rights. Most of the estimated 200,000 Rohingya population in neighboring Bangladeshi camps such as Chittagong and Cox’s Bazaar Plaza are undocumented and would only consider returning if Aung San Suu Kyi were leader of Burma, for they chances of more equitable treatment would be higher than compared to living under the military junta. So how will the new administration respond? Will they play mind games or accept the invitation? In the days leading up to her release, USDP secretary-general U Htay Oo reportedly said that the military wants ”to co-operate (with the NLD and Aung San Suu Kyi) for the betterment of our country,”. These words, while not a direct endorsement of for an all-inclusive roundtable discussion, at first glance appear to be the most positive statement delivered in some time. However, nothing has been heard from Senior-General Than Shwe on the matter, a man who seethes at the mention of Aung San Suu Kyi’s name and has never fully explained why. It is not clear whether his feelings are shared by the USDP or indeed other members of the military. Regardless of their personal feelings towards Aung San Suu Kyi, it will not stop officials from harassing civilians, in particular the most at risk, as typified by the recent targeting of HIV/AIDS patients at a clinic on Rangoon’s outskirts. Just one day after Aung San Suu Kyi’s visit to a health clinic highlighting the need to give greater attention to the issue of HIV/AIDS in Burma, authorities ordered the facilities to close and threatened residents and staff with eviction. Upon the surfacing of details that the clinic’s owner, Phyu Phyu Tin, was a colleague of Aung San Suu Kyi’s in the National League for Democracy, came calls of “political” motivation for the center’s closure. After international exposure, authorities relented, saying that the residents could stay on. This incident has become a source of embarrassment, for it demonstrates just how out of touch authorities are. The World Health Organization (WHO) have named Burma as one of 11 countries deemed “worst-affected” by HIV/AIDS, where 0.5 per cent of government spending is allocated for health care. What does this say about the authorities’ attitude towards vulnerable people? More importantly, what will become of the patients once they have moved? They will be added to the growing list of Burma’s forgotten people, whose lives will slip through the cracks of ill-equipped and understaffed government-run hospitals. Despite all of this, the junta has failed to dampen her willingness and enthusiasm, and the joy of watching Aung San Suu Kyi undertake the role she undoubtedly misses the most; as a mother. One of the more wonderful moments since Aung San Suu Kyi’s freedom is the time she has spent catching up with her youngest son, Kim Aris. Mizzima Television showed footage of mother and son taking a stroll through Bogyoke (General) Aung San Market in downtown Rangoon last Monday, with hundreds or thousands of onlookers cheering her every step. In one poignant moment, a woman greeting Aung San Suu Kyi to fulfil a lifelong dream of meeting her idol, could not be spoiled even with the presence of the sign “Government Registered Jewelry Shop”, a sign that the presence of government is unshakable in Rangoon. But this cannot take the gloss off the 5 minute visit that traders and customers alike, living in fear for so long, will treasure forever. In a world of political scandals, public relations stunts and seemingly pre-scripted interest by politicians worldwide, this one bit of footage is a reminder of what politics should really be about; connecting with the people. 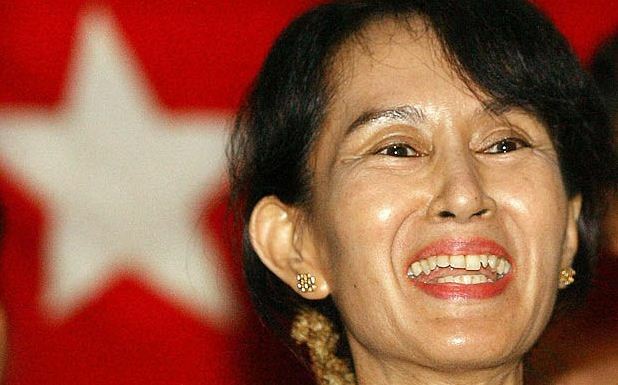 Aung San Suu Kyi is regarded in a light that most leaders in western countries dare dream of. This is because she cares genuinely for the people who have stayed loyal to her, without casting aside anybody who has made life difficult. Her vision is simple; a peaceful, democratic and fair Burma where restoring the country’s past does not involve the use of force. The time has come to end this ongoing bickering, which innocent residents pay the ultimate price for. The ban on the National League for Democracy must be lifted so that representatives of Burma’s diverse community can hear what each other has to say without bias or fear. Aung San Suu Kyi needs to be present simply because she will always be the voice of hope, one that adds weight to the drive for national reconciliation and peace. And if the new administration really wants to, they can become part of a force of good and not evil by adhering to the words mentioned in The Great Dictator’s closing speech. Doherty, B. (2010), Change to come from the people, The Age, Saturday 20 November 2010, http://www.theage.com.au/world/change-to–come-from-the-people-20101119-18131.html Accessed 22 November 2010. Interview with Zoe Daniel, Aung San Suu Kyi thanks Australia, ABC Radio – A.M. WITH TONY EASTLEY, Monday 15 November 2010, 8.03am AEST, http://www.abc.net.au/am/content/2010/s3066062.htm Viewed on 28 November 2010. Kaew, Nang Khem and Wade, F., Children ‘most at risk’ from HIV/AIDS, Democratic Voice of Burma, 1 December 2010, http://www.dvb.no/news/children-%e2%80%98most-at-threat%e2%80%99-from-hivaids/13161 Viewed on 1 December 2010.